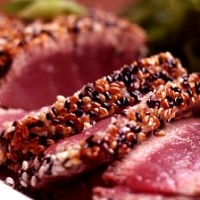 fresh and tender slices of rare tuna with a toasty crust! Combine the liquid ingredients and the scallions in a plastic bag. Place sesame seeds in a bowl. Roll the tuna in the seeds until well covered. Preheat a grill pan to medium high heat. Toss on the pan and sear for just a minute and a half on each side.